First, try changing the seed angle. Then click "loop through angles" to automatically change the seed angle by small increments. Then click "fade discs" to see pretty things happen. where r is the radius and Θ is the angle about the center (usually measured from directly rightward). This just means that, as you move out from the center, you shift around by an amount proportional to the square of the amount you moved out. 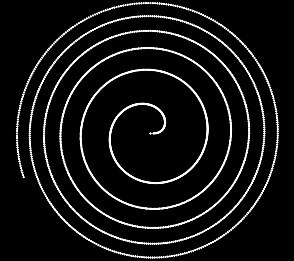 Since the square of a number is slow to increase at first, but gets faster and faster as the number increases, the spiral loops around slowly at first, then gets tighter and tighter. 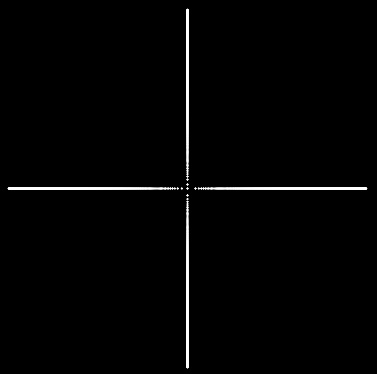 Similarly, a seed angle of 180° will only give you dots along a horizontal line. And this is just the beginning! It's really fun to experiment with different seed angles for Fermat's spiral, because you get some very nice patterns. I built this applet so that anyone can play with the seed angles for these patterns, and create some hypnotizing visuals in the process. This is the regular angular interval at which to drop dots, as you move out from the center of the spiral. Snaps to the golden angle (approximated here as 137.5°). This button toggles looping, which starts with the seed angle, steps by the "looping angle step size" defined below it, at a rate defined by "looping frame rate". This button toggles fading, which makes each disc fade from white to black, and back again, at a rate proportional to its disc number. (Discs are numbered outward from center of spiral.) Adjust these by setting the fade rate of both the "innermost" disc and the "outermost" disc. Fading discs in this manner was inspired by the wonderful postings of KrazyDad. Each disc is size according to its disc number. (Discs are numbered outward from center of spiral.) Adjust size range by setting the diameters of the "innermost" and "outermost" discs. One of my excuses for making this was to introduce myself to Processing. If you're learning too, or just curious, please feel free to look at the source code.